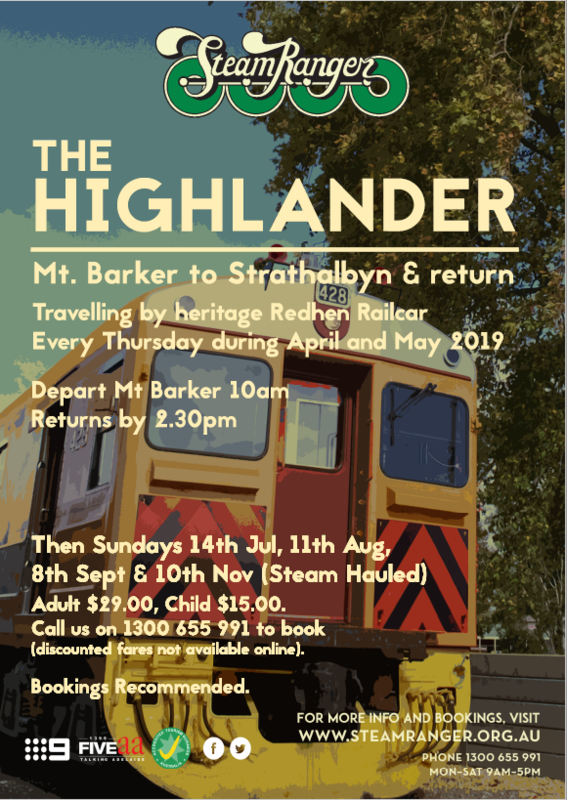 A short journey on board a heritage ‘Redhen’ railcar, or behind heritage steam locomotive 621 or Rx207 (Sunday’s only) from Mt Barker to Strathalbyn and return. The journey commences from Mount Barker station – a pleasant 20 minute drive from Adelaide along the South Eastern Freeway. Leaving Mt Barker mid morning, the train first climbs up to the crest of the line and then winds down the eastern escarpment of the southern Mt Lofty Ranges, passing through several long abandoned station sites which bear testimony to the importance of this branch line a century ago. Crossing the Angas River you then enter the historic township of Strathalbyn where many Scottish migrants settled in the early 1800s, influencing the early architecture which is still evident today. The town is well worth a visit to explore its well stocked antique shops and cafes. The return train leaves Strathalbyn at around 1.30pm for its climb back up the ranges to Mt Barker , arriving home around 2.20pm.